Playa Barca is a purpose built resort lying in an idyllic spot on the south eastern coast of Fuerteventura. With golden beaches washed by crystal waters, Playa Barca holidays are very popular with families with young children. Couples are attracted by its relaxed and friendly atmosphere. Holidays to Playa Barca can be enjoyed at any time of year as the wonderful Canary Island weather has warm winters and pleasantly hot summers. Our cheap Playa Barca holidays offer great value, as accommodation and service is good. With shops for essentials, restaurants catering for all tastes and quiet bars for mellow evenings, holidays in Playa Barca offer a complete break from the stresses of everyday life. A variety of water sports are available as are excursions to the island's tourist attractions. In order to make the most of your Playa Barca holiday car hire is recommended. 4x4 vehicles are necessary for some of the unmade roads around the coast and to the charming inland villages. 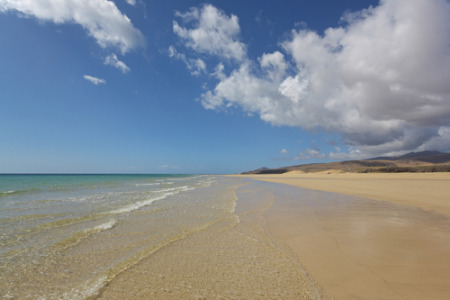 It is also possible to take catamaran cruises around the coast or to nearby Lanzarote. If you are seeking respite from our uncertain weather, take a look at our low cost playa Barca holidays and you could soon be dreaming of the sun on your back and sand between your toes. For further information and to view our last minute Playa Barca holiday deals, please use the search facility.